Time to United worldwide believers. Not one group but many groups around the world working together like God’s strategy in Matthew 12:25-26. Also, on a cross Jesus said he finished his part now you believers take it from here. He even appointed trainers to train his new army: Jesus gave some to be apostles, some prophets, some evangelists, some pastors and teachers, for the equipping of saints for ministry, the edifying of the body of Christ, till we all come to the unity of faith and knowledge of Jesus, to a perfect man, the measure of the fullness of Christ; that we be no longer children, tossed to and fro and carried about with every wind of doctrine, by the trickery of men, the cunning craftiness of deceitful plotting, but, speaking the truth in love, may grow up in all things into Him who is the head , Christ from whom the whole body, joined and knit together by what every joint supplies, according to the working by every part doing its share, causing growth of the body for the edifying of itself in love.” (Eph 4:11-16). Yes, the full ministry of Jesus’ power and authority is in every spirit filled, born again believer. Jesus’ commandment is to use power and authority to destroy works of evil, (1 John 3::8). VISION LORD GAVE ME NOVEMBER 9, 2003: I saw two very large, beautiful, but strong looking doors. They both opened at once and I could see into a very, very large and massive, yet beautiful room. I immediately knew it was some type of a throne room. As I looked into the room and across the massive floor toward the far side of the room, I saw a great throne chair and sitting on the throne chair I immediately knew was the King of Kings. The room, the walls, the floor, the throne chair and robes and crown of the King was like nothing I had ever seen, although it all looked very familiar. Then the King looked directly at me and I could see His face, although I could not see His face and He looked at me with a look like, “I want them to come in, the door is open”. I looked around to see who He was referring to that He wanted to come into the room and I saw a large number of people. Without Him saying anything I knew it was the Church on earth. I also saw people I knew standing in the front row of people. Although the two large doors were wide open, with nothing standing in the way, plus the large massive room was empty, but plenty large enough to hold everyone. In fact, if all the people were to enter at once they would look like a very small group in such a large room. The floor space was extremely massive, yet it was a room with four walls, a floor and ceiling. I stood and watched and no one was moving toward the open doors, but just standing and looking in. Then the King spoke to me saying, “Until they enter through the open doors they will only see the promises. If My Church will step through those doors coming into my presence they will be healed, see miracles ad many wonders.” I asked the Lord what was the finish of vision? The Lord answered, “Tell them to come in and experience my glory”. VISION LORD GAVE ME DECEMBER 6, 2006: He started by showing me something concerning ahead of us. It started with an Open Vision of land stretching out as far as of drying bushes and trees. Then I saw two large forearm and hands stirring up dirt planting a little twig like tree in parched ground. The tree was so small it looked impossible to grow. Again, the hands this time had a pitcher of water pouring around the little tree. Didn’t look like enough water to last long? The hands continued to pour waster as the little tree begin to look greener. Then I heard a voice saying, “The Lover of the Tree will furnish the water”. The land round the tree as far as I could see was desolate, as this tree grew greener and stronger. The water continued more as hands supplied all the needs of tree. Then the voice said: “The Lover of the Tree will care for it regardless of what happens to the land”. I knew the tree represented His Church as our faith walked the land. The two hands of personal attention and water, His Holy Spirit. From an individual believer to a universal body of Christ, the Lord showed me visually our increase, while also seeing our enemy’s dry up around us worthless. It all happens because of the Hand of God, not man’s hands or abilities, but together as one body of Christ. Above Visions taken from my books eight books build off writing separately building on one another through life’s journey, but not a set. 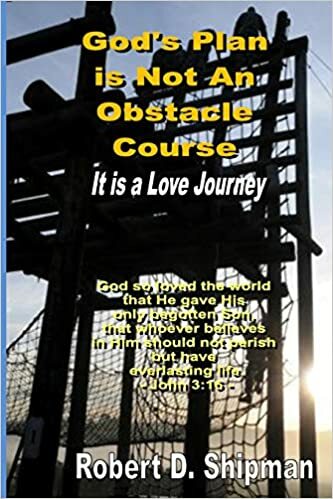 1) “God’s Plan is Not an Obstacle Course”. Actually it’s a Love Journey that unfolds how you and I fit into His plan. 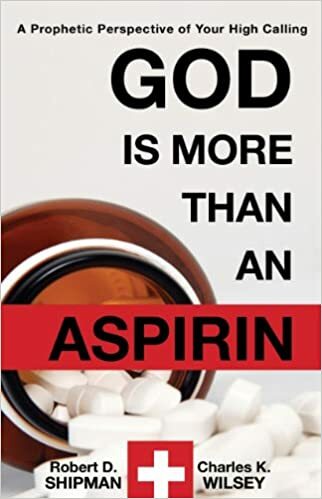 2) “God is More Than an Aspirin” looks at prophetic messages God shared with me. 3) “Step into His Present” helps believers to draw close to the Lord, uncovering importance of relationship with the Lord. 4) “A Call to Revival” stirs the church to increase desires to be part of growth maturing in Him. 5) “What God Wants to do for You”, true Christians have come to a the time of full conflict with evil’s army called to active duty, spiritual gifts take back what belongs to God and His us. 6) “Fifty Years of Spiritual Knowledge”, carries out a purpose covering over fifty years of to share Word and experiences, prophecies, as well as person accounts spiritually. 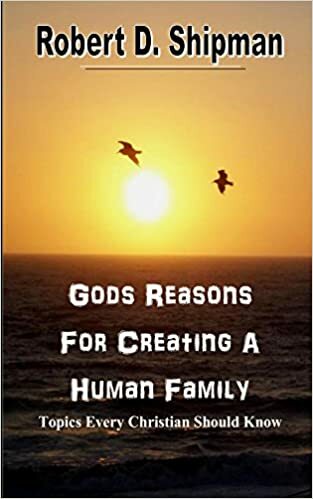 7) “Gods Reasons for Creating a Human Family” covering God’s plan from creation to now! 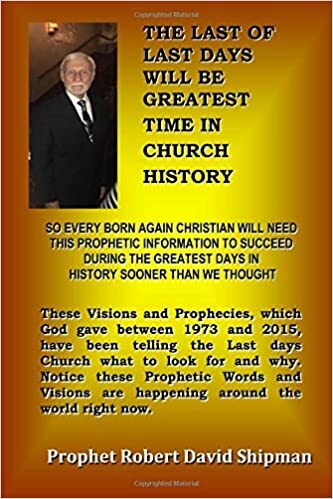 8) “The Last of Last Days will be Greatest Time in Church History”, Visions and Prophecies which God gave me between 1973 and 2015 telling last days Church what to look and why based on what is happening around world now. All can be purchased on Amazon in their Amazon Books area.